RBC raised its year-end forecast for the S&P 500 to 2,950 from 2,900. The new target would translate into a 18 percent gain for full-year 2019 and 3 percent gain from the current level. "We continue to believe the U.S. economy will soon climb out of the rough patch that the stock market paid the price for in December," says Lori Calvasina, head of U.S. equity strategy at RBC. The bank kept its 2019 S&P 500 EPS forecast of $171, which represents a 5 percent gain. A trader laughs ahead of the closing bell on the floor of the New York Stock Exchange (NYSE) on February 1, 2019 in New York City. RBC Capital Markets is getting more bullish on stocks as the bank bets on the U.S. economy to get "back on track." The bank raised its year-end forecast for the S&P 500 to 2,950 from 2,900. The new target would translate into a 18 percent gain for full-year 2019 and 3 percent upside from the current level. "We continue to believe the U.S. economy will soon climb out of the rough patch that the stock market paid the price for in December," said Lori Calvasina, head of U.S. equity strategy at RBC, in a note. "We do not currently see signs of euphoria that would make us cautious short term." 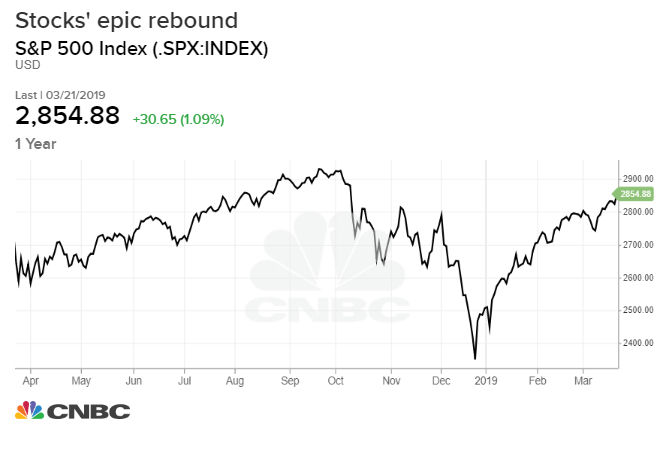 Stocks have risen more than 21 percent from the market's Christmas Eve low as risks of an economic recession and a full-on trade war with China recede. The rally also coincides with the Federal Reserve's policy reversal. The central bank signaled no interest rate hikes this year versus the two rate increases that were predicted as recently as December. The average S&P 500 target from the 17 top Wall Street analysts is 2,950, a CNBC analysis shows. RBC is not alone on Wall Street in dialing up its stock forecast. Credit Suisse this week raised its S&P 500 target for 2019 to 3,025 from 2,925, citing "more favorable" economic trends and "receding" market risks. RBC noted that stocks historically tend to rise after the Fed pauses at the end of a rate-hiking cycle. The price-to-earnings ratio "expanded modestly" around 2007 and 1992, both periods when the central bank shifted its monetary policy, Calvasina pointed out. The bank kept its 2019 S&P 500 EPS forecast of $171, which represents a 5 percent gain. That is higher than the Street's consensus of 3.8 percent growth this year, according to FactSet. Calvasina also said upward revisions to consensus "seem possible" if data on manufacturing strengthens, companies rein in costs, or the China tariffs are removed.